Well, sometimes I have to review beers so you don't have to. That means I'll have to try new products by Anheuser Busch sometimes.. so that means it's the return of Skunksworth's Barleyslime! 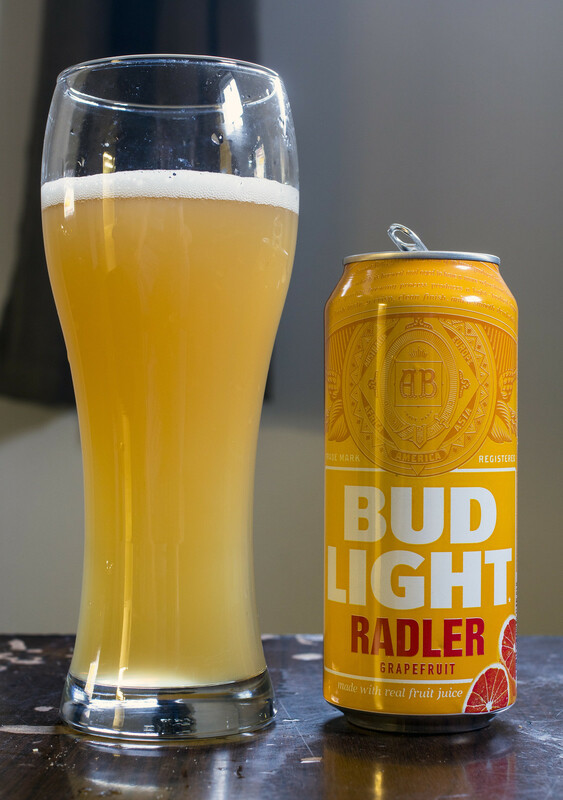 Today I'm taking a look at Bud Light Grapefruit Radler (or more likely just Bud Light Radler to most people), Labatt's third take on a radler this spring! Labatt already makes Lowenbrau Lemon Radler and Shock Top Radler but decided that they weren't taking up ENOUGH of the Radler market so they needed one from a brand that everyone will drink.. thus - Bud Light Radler. I've stated for many months now that summer of 2017 will be the summer of the Radler and it's certainly looking that way. Waterloo Brewing has been capturing a large portion of the market thanks to their popular Radler but just watch Labatt's Bud Light Radler capture 52% of the market because Manitoba is still a place where people think Bud Light is an awesome brand.. and this will somehow turn people into Radler fans over night, especially the people who thought Radlers tasted horrible last week.. now they will just absolutely rave about them with this product - I just don't understand it! Pouring the beer in the glass, it looks like cloudy piss but in reality it looks a decent amount like an actual Radler. Apparently the beer is made from real fruit juice which is a shocking as we know that previous Bud Light products loved to showcase as much extract as possible but yeah.. it apparently has concentrated grapefruit and grape juices. The aroma smells not as bad as I was expecting, mostly a vivid grapefruit bitterness to it - pepper, orange juice and even more grapefruit juice. It completely masks that corn water aroma from the Bud Light so that's actually a serious plus here. The taste starts out tart and lemony followed by notes of grapefruit and a moderate amount of pepper. Unfortunately the grapefruit juice is pretty watered down here, it starts off pretty bitter and tropical at the beginning but with each additional sip it diminishes a bit and leaves behind a somewhat metallic aftertaste to it that I'm finding in the beer as well. Do I notice any of that Classic Bud Light (TM) taste in there? Only a hint.. which is still better than the full on flavour of Bud Light. I do get a bit of a chlorine-like aftertaste as well.. not sure what that's about? Oh.. and I get a really long lasting grapefruit sweetness, if you love grapefruit sweetness, you'll love this, but if you don't like lingering aftertaste.. this is incredibly sweet! In the end, Bud Light Radler is not horrible but not great either. I'm finding it too sweet to the point that my tongue is feeling uncomfortable from the sugary fruit juice concentrate but that's expected in a lot of fruit-forward beers. Lastly, is it just me or does the label remind you a bit like Rickard's Radler? Same colour of can and a picture of grapefruits in the corner... a bit too reminiscent. I don't care if you pick this up or don't, it doesn't affect me in any way.. I'm just here to give my thoughts on it so some of you don't ever have to try it! Edit: It's April 26, 2017 and apparently I'm the only person who has flat out reviewed this beer. You're telling me that beer geeks aren't interested in trying Bud Light Grapefruit Radler?! Lemon Radler or bust (no ginger & other add-ins).